Why green tortoise?More for your money, free guest computers and WiFi! Free full breakfast daily! Free dinners three times per week! Free under bed lockers! Free sauna! Free tour information! Best facilities! 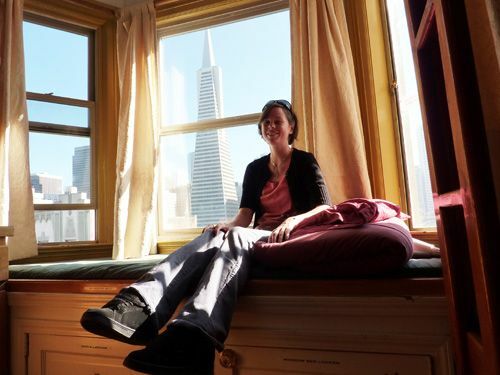 Clean, fun, safe with world travelers and adventurers and international staff of travel folks just like you.All this and a great location to be yourself in the city by the bay. We know our hostel is the best value for your euro, dollar or peso. When you stay here you feel like a part of our family. We may not tuck you in, but we take care of you like no other place you've been before. It's our mission to make your stay in San Francisco the best possible. If you need anything, all you have to do is ask us and we'll help without hesitation. To make here feel like home: we have no curfew, we do have a huge communal kitchen, a giant turn of the century ballroom with pool and foosball, a piano, cable TV, a bike rack and quiet places to fill in the journals of your travels. 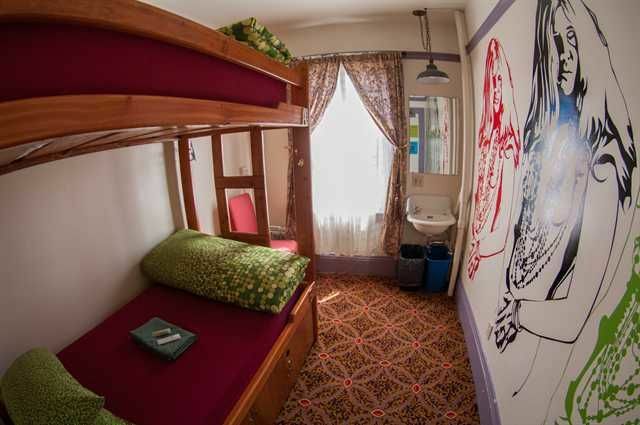 The rooms are all non-smoking with large lockers under the beds to store your gear safely, comfy beds with reading lights, self locking doors and new friends to meet. Our private rooms provide a chic hostel experience and a few have TV’s and a large selection of movies so you can chill out and have quiet time with your travel mate.We are in a fantastic location. You came to San Francisco to explore and there is no better place to start than in our own neighbourhood, north beach (little Italy), famous for entertainment, book stores, and beat generation history. 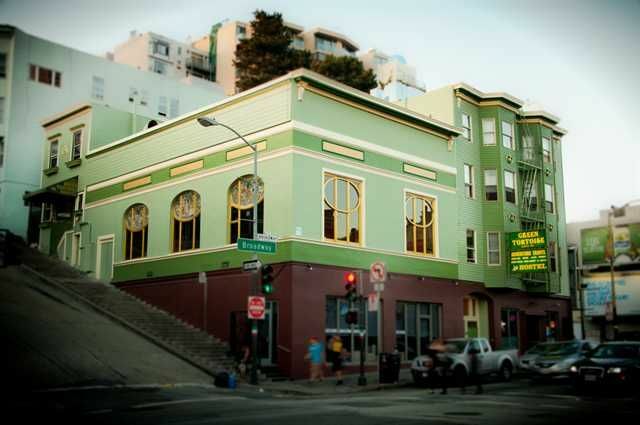 The hostel is only a few moments walk to Chinatown, a short walk along the San Francisco Bay to Fisherman’s Wharf, as well as located one block from public transportation to take you all over the bay area. Our friendly staff will take the time to give you a free map and directions to anywhere you wish to spend your day. They are also full of suggestions on what’s cool to do in San Francisco on any given day!Important: We currently accept Visa, MasterCard or US Dollars for payment at the hostel. Sorry, no personal checks or travelers checks can be accepted.Tax is not included in the price.Please note that there is a $20 key deposit for each person which is returned upon checkout. The key deposit must be paid in cash. Sorry, but the key deposit cannot be put on your credit card.Checkout is at 11:00 am.Check in begins upon availability.Our luggage room is available for those times before and after.We have a 48 hour cancellation policy. San Francisco International Airport:Shuttle van: You do not need a reservation; just walk up to one and tell the driver you want to go to Green Tortoise - 494 Broadway. Cost Is $19.BART train - costs $8.25 - takes 30 minutes. Exit at Montgomery, Walk one block away from the clock tower to Kearny and turn right. Walk 1 mile north to Broadway or get the Muni Bus No.8X and get off at Columbus (1 block south of Broadway).Taxi: will cost around $50.Oakland Airport:Take the Air Bart shuttle ($2) to the ‘Bart Station.’ From here get any San Francisco bound train and exit at Montgomery. Walk one block away from the clock tower to Kearny and turn right. Walk 1 mile north to Broadway or get the Muni Bus No.8X and get off at Columbus (1 block south of Broadway).Greyhound:The Transbay terminal is on Mission at First St. Public transportation: Walk to Third St and catch the 9, 30, or 45 Muni bus for $2.00. Get off at Broadway. Walking (1.3 miles): Walk up First Street to Market Street (the direction is against the flow of traffic on the one way street). Cross Market and First Street changes names to Battery Street. Continue walking north up Battery until you come to Broadway (10 minutes). Turn left on Broadway and walk 3 blocks to 494 Broadway.Driving:(The Green Tortoise recommends leaving the car at home, or returning your rental car before you reach San Francisco. Having a car in San Francisco is unnecessary and expensive! )From the south:Take 101 north, as you pass Ceasar Chavez there will be 4 lanes. Stay in lane 2 (second from right). Follow all the way until it becomes exit only at 4th Street. (When lane 1 disappears At 7th Street, don't change lanes.) Exit at 4th Street exit but curve left onto Bryant (not right onto 4th.) Take Bryant 1 block and turn left on 3rd Street Follow 3rd all the way to market and as you Cross market. It becomes Kearny. Follow Kearny to Broadway. From the north:Take Golden Gate Bridge to Lombard, left onto Lombard, follow Lombard to Van Ness, turn right on Van Ness, follow Van Ness to Broadway, turn left on Broadway, follow Broadway to Kearny.From the east:Take Bay Bridge, exit at Fremont (first exit), Fremont 1/2 block to Howard, turn left on Howard, take Howard to 3rd Street, turn right, on 3rd Street, follow 3rd to market where it becomes Kearny and on to Broadway.